Viktor & Rolf Create Magic! 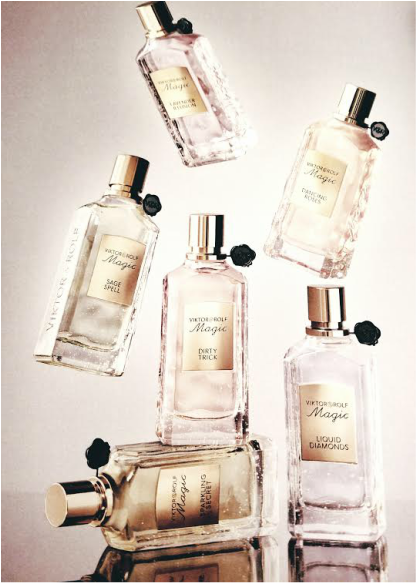 Viktor & Rolf's Flowerbomb took our breath away and now the Dutch Designers Viktor Horsting and Rolf Snoeren are back at it again with their new 'magical' fragrance collection. Lavender Illusion – A classic scent with a magical twist. The scent contains notes of Lavender, Blackcurrant, Musk and Pine. Dirty Trick: A distinctive scent that arrests the senses with top notes of Iris, Suede Accord and Cedarwood. Sage Spell: A radiant scent that offers an herbal bitterness coupled with aromatic sage. This scent contains notes of Grapefruit, Pink Pepper, Peppermint and Patchouli. Sparkling Secret – A fresh and sparkling sweet scent that contains notes of Ginger, Sweet Lime, Grapefruit and Vanilla. Dancing Roses – A ravishing scent that is referred to as "Floriental Fruity". This scent contains notes of Litchi, Saffron, Cherry Liquor, and Pink Peppercorn. One of our favorites from this magical collection. Not only are the fragrances magical, their packaging also contain an air of mystery. Each potion is packaged in irregular glass bottles laced with tiny, thin bubbles. The bottles remind you of the the past with an apothecary feel.